Dr. Catherine Rush Thompson and her team of contributors represent years of experience across the fields of physical therapy, occupational therapy, and speech-language pathology. 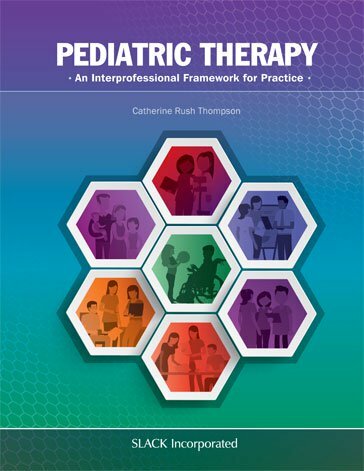 Rather than discussing each of these fields in isolation, however, the text explores professional roles and responsibilities, emphasizing essential skills needed for collaboration in a range of pediatric settings. Each section of Pediatric Therapy offers case-based learning activities requiring interprofessional collaboration for clinical reasoning to optimize care. This approach encourages an appreciation of the importance of holistic care, as well as an understanding of the roles, frames of reference, and approaches favored by each discipline. Pediatric therapists and others who work in healthcare and educational settings will appreciate Pediatric Therapy: An Interprofessional Framework for Practice as a guide for developing the interprofessional competencies needed to achieve desired outcomes for children and their families. Catherine Rush Thompson, PT, PhD, MS is a professor in the Department of Physical Therapy Education at Rockhurst University in Kansas City, Missouri, and a consultant for Community Living Opportunities—helping individuals with developmental disabilities achieve fulfilling lives in the community. Her pediatric therapy experience spans over 40 years, including owning a private practice and working alongside pediatric professionals serving pediatric populations and their families. Catherine has practiced in early intervention, home-based therapy, and educational, medical, and community-based settings, offering screenings and child- and family-centered care to infants, children, adolescents, adults, and older adults with and without developmental disabilities and other health care needs. With research and teaching experience in health promotion, pediatrics, motor imagery, neurorehabilitation, professional development, and clinical decision making, as well as interprofessional service in Ecuador, Guatemala, Haiti, and Kyrgyzstan, she brings a deep appreciation of interpro­fessional collaboration and cultural competency for providing high-quality care to all communities. Her most recent publi­cation, Prevention Practice and Health Promotion: A Health Care Professional’s Guide to Health, Fitness, and Wellness, Second Edition, addresses health care issues across the lifespan and emphasizes holistic care. She hopes that Pediatric Therapy: An Interprofessional Framework for Practice will provide a foundation for engaging students and clinicians in interprofessional discussions and activities that will enhance the quality of care in pediatrics.